Retail rumours and ESRB age ratings let us know that Aliens: Infestation was approaching, and now SEGA has finally lifted the lid on its upcoming DS title. Developed by WayForward in conjunction with Aliens: Colonial Marines developer Gearbox Software, the game features typically handsome WayForward sprite work and apparently boasts a cast of nearly 20 playable characters. We have the first screenshots below. Aliens: Infestation is making a move for DS in September. IS THAT A PULSE RIFLE IN YOUR POCKET OR ARE YOU JUST HAPPY TO SEE ME? 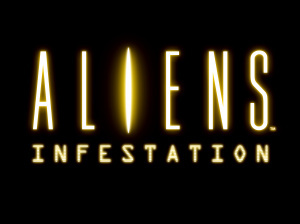 LONDON & SAN FRANCISCO (July 20th, 2011) – SEGA® Europe Ltd. and SEGA® of America, Inc. today announced Aliens: Infestation™ for Nintendo DS™, bringing the action-packed experience of the popular ALIENS™ film series to Nintendo’s best-selling handheld console in September 2011. Players will be able to recruit and play as 19 different marines, each with their own unique dialogue, and explore iconic environments including the Sulaco, the Derelict ship, and LV-426. Aliens: Infestation is an action-heavy side-scrolling exploration game and will be part of the ALIENS expanded universe. Aliens: Infestation will be available September 2011 on Nintendo DS. So IT IS a contra style side scroller. Looks nice! Would have been nice for this to have been a 3DS game instead! Looks cool! Love Way Forward games on the DS! I dont know about anyone else, but I seriously hope a Predator would be a secret character. I mean, I will buy it either way, but it would be fun as heck to play my favorite alien race blasting Xeno's on the go! Man I haven't played a game like this since the Jurassic Park game on the Sega Genesis. Very pumped for this. And here I thought Kirby: Mass Attack! was the last title worth getting for the DS. WayForward did an excellet job with Contra 4, so I'm pretty pumped for this one! hell yeah NassaDane! haha jurassic park on the Genesis was the bomb,good times,i liked the second JP game on the Genesis more because you could use the raptor as a playable character! Day one purchase! Cancel this again SEGA and you'll lose my business for the next year, seriously. Nice, might have to scoop this up if it's good. Awesome! A Metroid-style sidescrolling shooter! Definitely looks promising, especially since its WayForward. Kinda doubt I'll buy it, though... Maybe I'll look for it on sale, cuz you know it probably won't sell very well, unfortunately. Screenshots look promising for sure. Could this turn out to be a mixture of Metroid and Contra ? Rated T or M !?! And you know that if it's anything like Contra 4 it's going to be great!